The Taurus 709 Slim is a super-compact 9mm pistol that will easily slide into a pocket or waistband. Slim is the name of this slick new entry into the Taurus line for a reason: Available in both blue and two-tone stainless or titanium, this small pistol can easily fit into places that are not normally concealment locations. Due to the slim lines, there are no revealing bumps, which makes concealed carry easier than ever before regardless of your needs. The 709 is available only in 9mm and features a striker-fired single-action trigger with the shortest reset I’ve ever felt on a factory built pistol. With a 7+1 shot capacity (9+1 with an extended magazine), this slick little “slim-line nine” will handle just about any situation a lone individual might face. The pistol weighs just 19 ounces, and measures a mere 6.24″ long and less than 1″ thick. The trigger guard is big enough to engage the trigger even when wearing gloves. A lever in the face of the trigger prevents rearward travel unless it’s squarely engaged, so inadvertent compression of the trigger is reduced, a nice touch when carrying the gun in deep concealment. Also included on the 709 is a visual loaded chamber indicator as well as the Taurus Security System, which allows users to securely lock the gun using an inconspicuous keylock. The low-profile three-dot sights are a nice compromise between having enough of a sight picture to see quickly and keeping them small enough that they don’t snag when worn concealed or hang up on the draw. While the three-dot configuration does not work for my tired old eyes, they do work for most people. In my case, I painted the front sight with a layer of white appliance touch up paint and once it cured, covered that layer with some bright finger nail polish. This produced a high-visibility sight I can see in a wide range of light conditions that will stand up to gun cleaning solvents. The contrast worked well with the rear white dots and took minimal effort. The 709 Slim with the stainless finish. The polymer frame offers a trim grip with molded texturing for a solid hold. The grip has a nice curve to the backstrap that adds gripping surface without bulk to the compact lines. Some will say the grip is actually too small for getting a solid two-handed hold, but keep in mind what Taurus was trying to accomplish here. This is not a service grade or even an off-duty gun, it’s a deep concealment weapon that will go anywhere, hide anywhere but still offer enough power to end an attack quickly. (When loaded with a street-proven 9mm load, the Taurus 709 Slim should easily do this if the shooter does their part.) To help add to the grip surface, the polymer frame has index pads on each side of the frame below the slide. By inserting the support-hand thumb into one of these indents, the support grip will be consistent while also offering an additional contact point. Another nice feature of the Slim is the simple takedown procedure. One can’t help but compare it to the Glock: When you pull the slide to the rear and manipulate the dual pull-down latch, the slide comes off the end of the frame. The Slim also has a slide-lock lever and a simple frame-mounted, push-up safety that locks the gun’s action. I headed off to the range with the new Slim and what I had left of my dwindling supply of 9mm ammo. I don’t like to bench-rest guns intended for fighting, especially a gun like this whose sole purpose is close-quarter personal defense. I’ve been a serious student of individual combat my entire adult life, and this study, along with my personal experiences, has led me to a number of conclusions about the subject. One of these is that more people miss their target because they can’t control the trigger. Forget point shooting versus sighted fire—if you can’t control the trigger, you can’t control the gun, period. Thus, I test the accuracy of this type of gun off-hand at reasonable combat distances. In the case of the Slim, I chose 50 feet, though in reality that’s actually a bit far. But what the heck, if it will hold a 50′ group, closer should be a snap. The 709 Slim with the titanium finish. Hornady ammo is known for its accuracy, and the first four rounds went into a 1″ red dot at the center of the Birchwood Casey Dirty Bird target. On the fifth shot, I couldn’t help but marvel at my wonderfulness, and you guessed it, I pulled the shot low left. 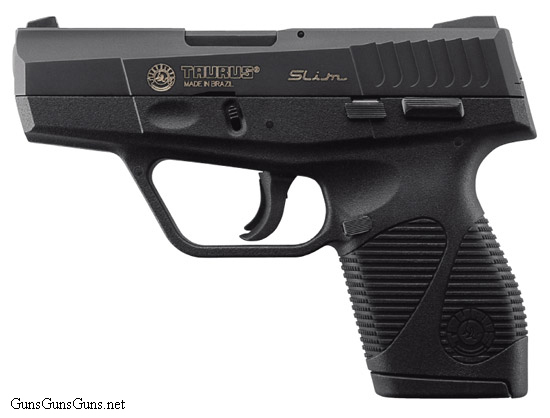 All the loads used would be a good choice for the Taurus Slim, though the felt recoil will be a challenge. The grip of the Slim is quite small in an effort to keep the gun as compact as possible, so there’s not much to hold on to. Rapid-fire groups required a great deal of concentration, so if you’re going to carry the Slim, you might want to consider a load that’s not as hot. Remember: The most battle proven loads will be of no use if you can’t hit what you’re shooting at, and rapid follow-up shots might be needed to end the fight quickly. Choose your load wisely for this little gun. The remainder of my range time consisted of classic drills such as the Bill Drill, El Presidente’, the Double Nickel and running through the Crucible instructor standards. When I ran out of ammo, I’d fired 337 rounds through the Slim without a single malfunction. Several folks who were at the range tried out the Slim and all commented that the grip was indeed small, but it was also a very nice gun to shoot. Once again, this gun has the shortest reset of any factory gun I have event tested. This easy-to-work trigger action resulted in some fine split times as long at I concentrated on hanging on. Did I encounter any problems? Sure, but they weren’t the gun’s fault. Forget trying to do a competition style speed load with the Slim. The short grip, slim magazines and flush magazine button made such a reload all but impossible. With practice you will get better, but if a larger button and grip were incorporated into the design, then it would no longer be Slim, would it? Other than this, I found the Taurus Slim to be a very pleasing gun. Would I buy it? Heck yes! 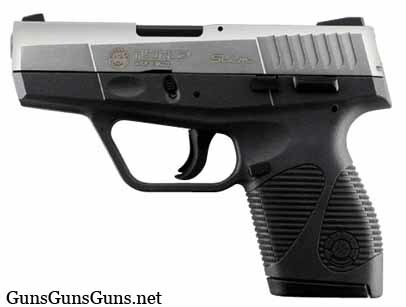 As a matter of fact, I might just add this Taurus Slim to my personal collection. 9mm 7+1, 9+1 3″ 6″ .96″ 4.53″ 19 oz. This entry was posted in $251-$500, 9mm, Semiauto, Subcompact, Taurus and tagged Handgun Reviews on September 2, 2010 by Dave Spaulding. Purchased this model a year ago and am very pleased with it! Heard some whining about how it won’t shoot 115gr FMJ without jamming but…guess what? If you read the owners manual it specifically recommends 124gr ammo! Use it and you won’t be disappointed…the reason is that the slide/recoil spring is extremely stiff (almost like a Glock Gen 4) and 124gr FMJ or 124gr HP is the way to go! This is not a ‘target’ gun…it’s only suited for ‘social work’…practice with the recommended ammo! Bought one in Jan for my wife, fails to fire on two to three in every mag i have used, ran about 250 124 grn pmc,fed and ect. After the front sight fell off at the range i finally sent to Mfg for repairs, two months and still have not received back, they will not tell me if it is fixed but it might ship next week. To D Percell – I have a five Taurus handguns. A 44 mag revolver, a 22LR/22mag revolver, 24/7 9mm , 24/7 9mm compact, and a TCP 380 pistol. I have had some for 25 years and not one has ever malfunctioned in any way. They all have fed, fired, extracted, and ejected every round. Further they are all very accurate. I have $1660 total invested in all five guns. I have seen S&W’s malfunction on the range. You either got a gun with a rare problem, or you are not using it correctly. I have friends who I have taken to the range and had S&W’s malfunction for them, because of incorrect procedures they use. 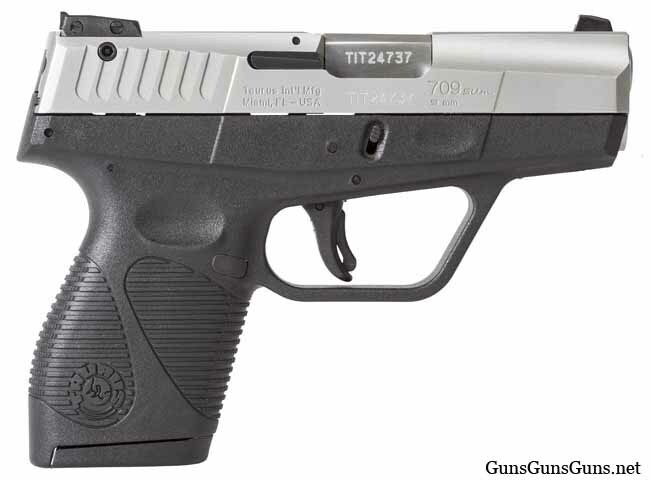 I BOUGHT A 709 TAURUS BECAUSE OF ALL THE GREAT REVIEWS. I HAVE TO SAY IT HAS BEEN A GREAT DISAPOINTMENT. THE GUN IS A PIECE OF JUNK. THE GUN IS TOTALLY INACCURATE. I SEND IT BACK TO TAURUS INTERNATIONAL AND WAS TOLD THERE WASN’T ANYTHING WRONG WITH THE GUN. A REPERSENTIVE OF TAURUS (ROBERT 1-305-624-1115 EXT 2277) TOLD ME THAT TAURUS DOESN’T GUARANTEE THEIR ACCURACY. EIGHT PEOPLE FIRED MY GUN AND THEY ALL AGREE THERE WAS WRONG WITH THE GUN. I DON’T RECOMMEND THIS GUN OR ANY OTHER TAURUS. Purchased this gun in early 2010, and have put over 2,000 rounds through this firearm without malfunction. It eats everything I feed it, including +p and +p+ loads from Buffalo Bore and Doubletap Ammo. Slides right into my pocket, but I usually carry iwb. I highly recommend this for a concealed carry pistol. I purchased this gun 06/2012 and can’t get over what a pleasure it is to shoot and carry. I do have small hands and I have no trouble with holding and shooting. Just bought one, 150 rounds through it no problems. I just don’t like the trigger. Too long and tight. I received a Taurus 709 for Christmas 2011,it has functioned flawlessly with every kind of ammo,I let my friend shoot it at the range,he was so impressed he offered to trade 2 glock 26’s for it,I turned him down because I have owned several glocks and they are not dependable.The reason he doesn’t go buy one is because he can’t afford one right now but he has several glocks he wants to get rid of. I bought a 709 Slim about 4 yrs ago. At first it was inaccurate and on occasion would have FTF or FTE. I couldn’t get the hang of adjusting the sight correctly–even with instructions. I sent it back to Taurus. A month later it came back with a new barrel with a ‘highly’ polished feed ramp. They’d also adjusted the rear sight for me and sent me the shot-up target they used as proof. Since then it shoots like a champ, is highly accurate–I’d bet my life on it.I plan to add a fiber optic front sight. I got what I was looking for but I have big hands and find it difficult to draw or shoot accurately. It is accurate but you have to work at it with big hands. Midway offers some sights and that’s about it. Shoot it for a while before you make the mistake of extras into the gun. Ho dumb asses who write stupid bad reviews about a pistol that is very good and most all reviews like! It is not a $1,000 tight target weapon, it’s a small barrel 9mm. Very hard to shoot accurately,over 50 ft unless you know what you are doing, most don’t! Proper quality ammo and proper weight is critical . Most dont! Buy a rifle if you want an accurate gun at 50 ft, or a shotgun! I have a 6″ Dan Wesson pistol I can shoot an eye out s man size target 75′. My 4″ auto field grade is a 40′ lucky to hit the head, torso is best. 2″to3″ barrels are 20′ range accurate at best, or luck! Was in military on a pistol team, seen it all! Bought mine in June 2017. Not a big fan of the magazine release but when I took it to the range it printed 2-3 inch groups free hand @ 10 yards with PMC 115gr FMJ ammo and I an average shooter. Shot a little low and to the left of point of aim but that can be corrected. Only problem with failure to feed was with an 8 shot pro-mag (piece of junk). 8 out of 8 FTF. Over all like the gun very much. Going to try 124 gr ammo to see how it shoots next. I totally agree with your article. I also solved the small grip issue by getting the Grip Extension for the magazine. I bought my Taurus 709 Slim a month ago. I have fired a variety of factory and hand-loaded ammo including 124-125 grain JHP, JRN, LSWC and JRN bullets at velocities from 1040 fps to 1203 fps. They all shoot fine. I also tried some of my hand-loaded 115 grainers that are loaded fairly hot (over 1240 fps). They all worked fine, too, but printed a little low on the target, and the brass didn’t fly as far as with the hot 124 grainers. I’ve only put a couple of hundred rounds through it so far. No malfunctions of any type. I love this gun. I like mine. No it’s not a $1000 gun. But it it’s accurate and functions reliably. I can hit better with this gun than others I owned. Besides it’s not for everyday shooting, it is for self defense. Everyday shooting is why God made the 22lr. By the way, Many who have a problem with accuracy it is because your not use to the trigger pulling all the way back. I was having the same issue because I was use to other pistols, and I was not use to the long pull.. It is s muscle memory thing. Without realizing it my hand would move downward and slightly to the left. You just have to get used to it and not move your hand. I am just glad I noticed that before I started moving the sights around. I owned a PT111 G2 for two years before adding this to my stable. It is basically a sized-down clone of my PT111 in every possible way: same trigger but lighter. Same take-down procedure. Same tactile chamber loaded indicator. Same spot-on accuracy and consistent reliability. It’s now my EDC after having struggled somewhat with my larger PT111 in an IWB holster positioned as an appendix hold. I’m left-handed and this is the ideal position for me. Like my PT111, I added a Laserlyte red laser to the PT709 (while my PT111 sports a Crimson Trace green laser) and it fits the trigger guard as if it came out of the factory with it. The activation buttons on both sides are easily reached with either finger. I found an inexpensive IWB holster on Amazon that holds the gun and laser firmly in place and feels great against my torso. I also bought two spare 9-round mags for it that come with finger extensions. They’re made by Pro-Mag and they required a bit of breaking in before they functioned properly. What works the best for this gun are BIOG BULLETS! If you use 147 grain self-defense ammo like Winchester’s PDX-1 or their Train and Defend series, or the always dependable Federal’s Hydra-Shok, not only will the felt recoil be lower, but you’ll also be sending some serious shrapnel down range. At under $200, it beats guns costing twice as much!